Chaos theory is a field of study in physics, mathematics, and philosophy examining the behavior of dynamic systems sensitive to preliminary conditions. Differences in initial conditions yield widely diverging outcomes: chaotic systems; rendering long-term prediction impossible. An easy way to think of it is the Butterfly Effect (exemplified in science fiction, predominately time travel scenarios): a single action in one area has a potential effect in unpredictable ways anywhere (and any-when). Chaos was the first of the Greek Gods to materialize during the creation of the universe. Like an envelope of brooding mist, She surrounded the earth with potential. Chaos was the Mother of the manifestations: Nyx (Night), Erebos (Darkness), Aither (Light) and Hemera (Day), and the spirits of Elemental Air. She was also a Goddess of Fate who bore a daughter Nyx and in turn produced Her grand-daughters of the Moirai who assigned the inescapable destiny of man. In both the linguistic and the mythic sense, Chaos is a state where there are so many random events, there form new and sometime innovative substances, methods and ideas. As exemplified in the decent from the Goddess Chaos, the result is the opposite: In the beginning there was Chaos (general havoc and unpredictability) who gave birth to fate (general order) who then gave birth to Destiny (specific order): Order in the most rigid sense. To break out of this cocoon of stagnation (assigned destiny), one turns to chaos to break free the pattern. For those interested in the edge of manifestation, I have created The Chaos Amulet. 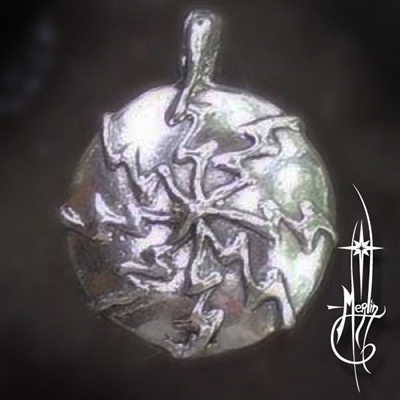 Signified by the classic lighting bolts expanding from the center, the symbol is stretched over a near hemisphere shaped amulet. If you are interested in Hundun or Eris; if you are Gnostic or simply pragmatic, this amulet is for you.